Climate changes, aging infrastructure, increasing population, and shifts in land use and urbanization present challenges for managing water resources in urban area. Water reuse is receiving increasing attention as a strategy that can improve reliability and drought resistance of water supplies. Direct potable reuse (DPR), in which purified water is introduced directly into a potable water supply distribution system, is considered as a viable water reuse option. 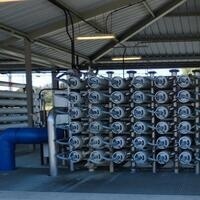 Reverse Osmosis (RO) has its application for removing trace chemicals and pathogens in DPR applications. This talk provides an overview of direct potable reuse, RO application, and technical challenges of RO, followed by recently completed WateReuse Research Foundation Project for predicting the removal efficiencies of trace chemicals in RO for DPR practices. The talk will also discuss the research questions that need to be addressed in membrane research for potential collaborations with other MTU researchers toward new membrane material development and mechanistic understandings of RO technology.